The complete CAPRISTO high performance system is intended to be a balanced increase between power, drive ability and sound quality, without forgetting of course a substantial loss of weight. All of this is delivered while maintaining the CAPRISTObest of both worlds philosophy which provides the capability to produce an aggressive exhaust note under acceleration and a more subdued sound for city driving. An additional 60Nm 90Nm and approximately 50hp increase was measured in the lower range of rpm. In the upper range of rpm’s it was an increase of approximately 15hp. The exhaust valves are backpressure-controlled and via the included Valve ControllerRemote which allows you to control the flaps to open permanently, without the in-series control being able to intervene. When the exhaust valve system is closed again with the use of the remote control unit, then the in-series control unit will again take over the control of the exhaust valves. This allows precise control of the exhaust based on the drivers personal tastes and tolerance. These lightweight test pipes fit in place of the heavy OEM catalytic converters. Using test pipes removes the flow restriction a catalytic converter places on an exhaust system, while increasing the horsepower. The silencing effect of the converters are also removed, enhancing the aggressive engine sound. Test pipes are ideal for track days and race application. Lambda or Oxygen Sensor Bungs are pre-installed and threaded. To disable a recurring CEL you will need to tune the ECU or use 02 Sensor Extensions. More Sound. More Power. No Drone. Are you looking for more sound out of your 997/991 GT3 without sacrificing street drivability? 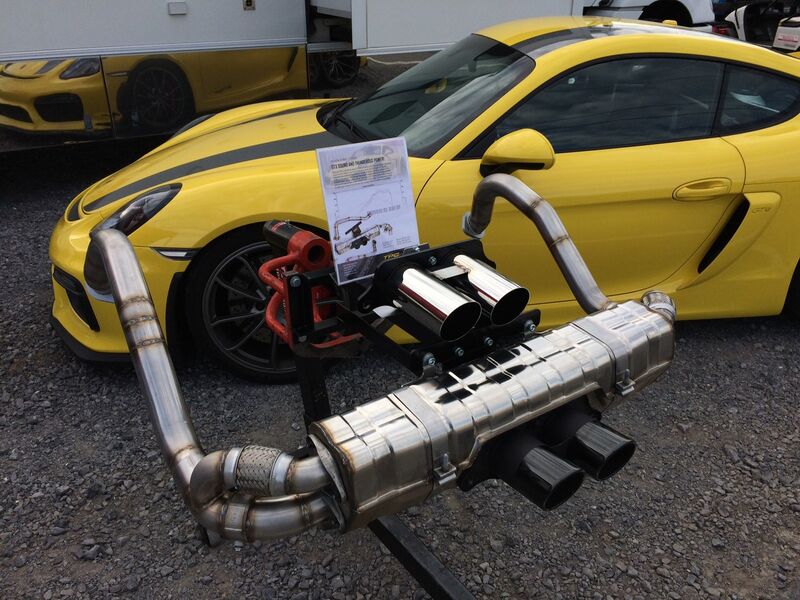 Look no further than the TPC Racing Active Side Muffler Bypass pipe. It provides cup car sound and performance when you want it, while eliminating unwanted cabin drone and excessive noise in normal street conditions. All this while improving performance and handling. Using a factory-style actuator-controlled valve, the TPC Racing Active Side Muffler Bypass System provides cup car sound and performance in higher rpm/higher load ranges, while eliminating unwanted cabin drone and excessive noise. Its lightweight design saves 40 lbs from the OEM side mufflers, resulting in improved handling. Better exhaust flow management allows for increased torque between 2,600 and 5,600 rpm, as well as increased horsepower between 5-8,250 rpm. The complete CAPRISTO high performance system is intended to be a balanced increase between power, drive ability and sound quality, without forgetting of course a substantial loss of weight. All of this is delivered while maintaining the CAPRISTO best of both worlds philosophy which provides the capability to produce an aggressive exhaust note under acceleration and a more subdued sound for city driving.